Kapalua Resort is home to a series of signature events and programs throughout the year. Participants can experience the best the world has to offer from athletics to wine and culinary celebrations. 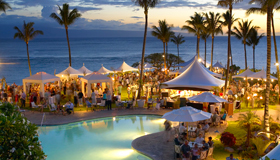 Kapalua Wine & Food Festival is the longest-running and most prestigious festival of its kind in Hawaii. Every June, the world’s most renowned winemakers, top sommeliers, and celebrated chefs come to Kapalua for a weekend of exhibitions, wine tastings, and gala events. Each January, the PGA TOUR holds the Tournament of Champions at the legendary Plantation Course. Watch as golf’s greatest players compete for this prestigious title in an elite field comprised of only winners from the previous PGA TOUR season. Come share aloha with Hawaii’s most reputable artisans, educators, cultural practitioners, and entertainers as they convene for the annual Celebration of the Arts at The Ritz-Carlton, Kapalua. Hands-on art, demonstrations, films, cultural panels, music, and dance are all a part of the “Number 1 rated cultural event” according to Hawaii Modern Luxury magazine. Let our wellness practitioners take you on a journey to a balanced mind, body and soul during Wellness Week at The Ritz-Carlton, Kapalua. Explore all facets of total body health and wellness from Yoga and T’ai Chi to nutrition and de-stressing techniques. Morning workouts are followed by afternoon interactive sessions led by the award-winning practitioners from all over the United States. During this one-of-a-kind event, experience as many as of the sessions you like, sip skinny cocktails poolside, indulge in select farm-to-table menu items featuring ingredients from our onsite organic garden or simply contemplate the waves under a canopy of coconut palm trees. Events are complimentary unless otherwise noted on the event schedule. 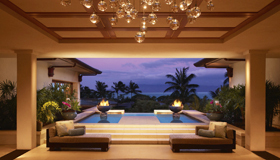 For a full event schedule, practitioner bios and more, please visit www.kapaluawellness.com. Play for P.I.N.K. Kapalua is a golf and tennis-themed weekend tournament to benefit the Breast Cancer Research Foundation (BCRF). 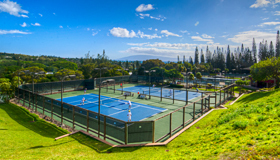 Held at Kapalua Resort, home to award-winning championship golf courses, one of the world’s best Tennis Academies, breathtaking beaches and luxury hotels, the first annual Play for P.I.N.K. will include opportunities to participate in golf and tennis tournaments, fundraising celebrations at local restaurants and hotels, a fashion show, wellness and spa activities, unique Maui based adventures and more. For participation information visit www.playforpink.org/kapalua. Kapalua Resort’s new annual dining promotion, Kapalua Restaurant Week, launched to raise money for the community. Participating restaurants will offer a special menu or menu item daily, exclusively for Kapalua Restaurant Week, of which $1.00 will go to support the Aloha Backpack Buddies program for every restaurant week item sold during this timeframe. Additionally, Kapalua Restaurant Week restaurants are partnering with Maui Organic Ocean Vodka and Deep Island Hawaiian Rum to offer craft cocktails featuring these locally made spirits.